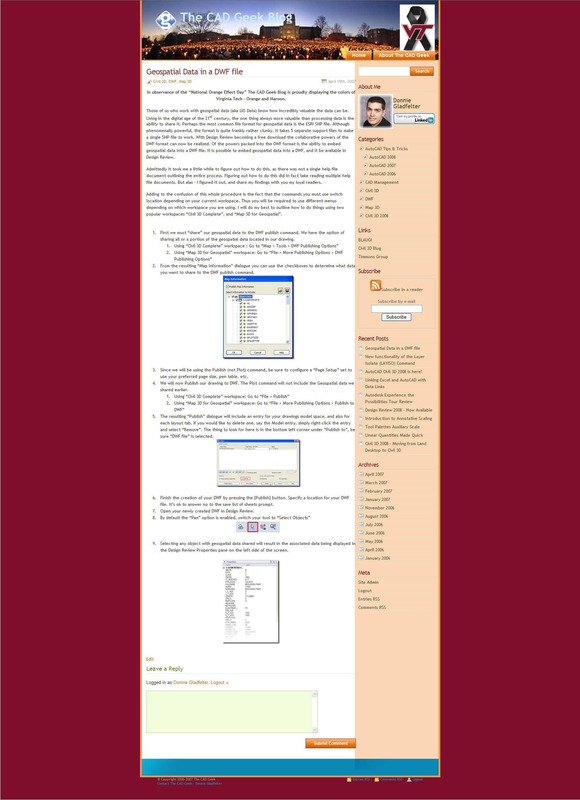 In observance of the “National Orange Effect Day” The CAD Geek Blog is proudly displaying the colors of Virginia Tech – Orange and Maroon. Those of us who work with geospatial data (aka GIS Data) know how incredibly valuable the data can be. Living in the digital age of the 21st century, the one thing always more valuable than processing data is the ability to share it. 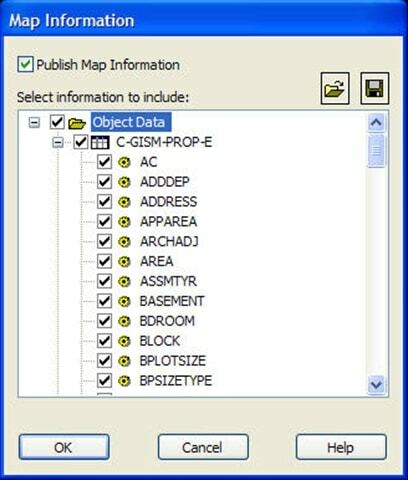 Perhaps the most common file format for geospatial data is the ESRI SHP file. Although phenomenally powerful, the format is quite frankly rather clunky. It takes 5 separate support files to make a single SHP file to work. With Design Review becoming a free download the collaborative powers of the DWF format can now be realized. Of the powers packed into the DWF format is the ability to embed geospatial data into a DWF file. It is possible to embed geospatial data into a DWF, and it be available in Design Review. Admittedly it took me a little while to figure out how to do this, as there was not a single help file document outlining the entire process. Figuring out how to do this did in fact take reading multiple help file documents. But alas â€“ I figured it out, and share my findings with you my loyal readers. Adding to the confusion of this whole procedure is the fact that the commands you must use switch location depending on your current workspace. 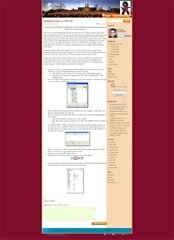 Thus you will be required to use different menus depending on which workspace you are using. I will do my best to outline how to do things using two popular workspaces “Civil 3D Complete”, and “Map 3D for Geospatial”. First we must “share” our geospatial data to the DWF publish command. We have the option of sharing all or a portion of the geospatial data located in our drawing. From the resulting “Map Information” dialogue you can use the checkboxes to determine what data you want to share to the DWF publish command. Since we will be using the Publish (not Plot) command, be sure to configure a “Page Setup” set to use your preferred page size, pen table, etc. We will now Publish our drawing to DWF. 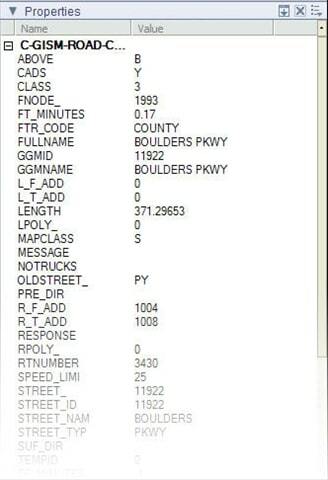 The Plot command will not include the Geospatial data we shared earlier. The resulting “Publish” dialogue will include an entry for your drawings model space, and also for each layout tab. If you would like to delete one, say the Model entry, simply right-click the entry and select “Remove”. The thing to look for here is in the bottom left corner under “Publish to”, be sure “DWF file” is selected. 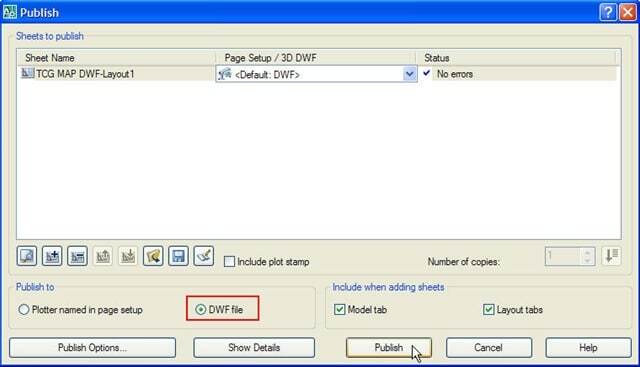 Finish the creation of your DWF by pressing the [Publish] button. 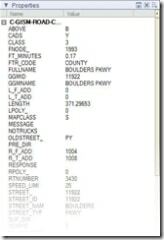 Specify a location for your DWF file. It’s ok to answer no to the save list of sheets prompt. Open your newly created DWF in Design Review. 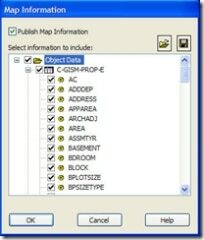 Selecting any object with geospatial data shared will result in the associated data being displayed in the Design Review Properties pane on the left side of the screen.